It's stuff like these I'm hoping someone will be willing to help make. new objects in the H4 style that can function as new objects, be it dwellings, creature banks, Quest huts or just adventure objects of some kind. These are the kind of objects we can currently add/edit to/within the game. If we manage to process with dll extensions, stuff like new Creature Skins would also be a nice addition, but for now the above seems more doable. Specific tasks as of now, would be to animate the Sea Monster Dwelling to give the red light a glowing effect. The Mega Dragon Lair, I've made attempts to animate the eyes to come forth and be visible and the tail to move. The last part, I'm not pleased with and could use competent help. 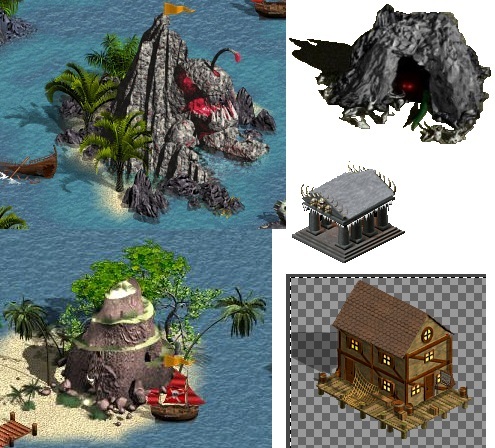 I'm uncertain if the Equilibris intended the lower left object to be a Mermaid Dwelling, but such an animated object would also be much desired. So if there's anyone outthere, give a shout out..
That will be hard to find, good luck. My suggestion - while waiting for a miracle - is to create yourself animations on those static objects, using already done animations you can find for free in images banks. So basically you need to find some 3D basic object, extract all frames then work with layers. Because, in 15 years of visiting HC, I never saw a graphical artist positively answering to demands, but zillion of people asking for one. Thanks for the suggestion Salamandra. Any suggestion for a good image bank or should a google search be sufficient? Edited by NimoStar at 20:10, 13 Jan 2019. Edited by Karmakeld at 20:28, 13 Jan 2019. Thanks for the clarification. Didn't strike me as intended for Mermaid Lair either, but haven't - yet - tested your mod or 3.55. Hmm. I can't see any image bank link in the PNG tread, so was it in another tread? Well I have planned alot of object mixing or Kitbash if you will, still that doesn't solve the issue of animating the static ones I posted. Also I don't see any of the existing objects fitting to being transformed into a Mermaid dwelling, which is why I hoped for someone with the skills to do one from.scratch. Edited by NimoStar at 05:13, 14 Jan 2019.
it was in the thread that someone (radmutant?) was making new creatures. Anyways my upload is probably gone now. I reccomend downloading this game (less than 200 mb), after installing, all resource folders are simple PNGs and they include hundreds of objects, easy to convert. I tried equilibris a lot and compared it to vainilla h4 before making my mod. Got it. I recall the tread/link there, but at the time I mostly looked for useable objects, not their effects, but I'll take another look. Else I'll probably find a way, although it'll take a loy of work. I know how animations work and can for the most part easily import them, bit making an animation from scratch is my challenge. For the Dragon Lair I've managed to make the eyes appear as if they come forth and stare for a bit and then withdraws/closes, while I also want the tail to move. But bending the tail in Gimp just makes it lose quality and the best way I can do it, would likely be a pixel by pixel move which is just cumbersome work. For the Sea Monster dwelling I'd like to add a radient glow, but I'll see if I can't find some effect from another object and make it fit..
Edited by mciric at 12:46, 20 Jan 2019. For example, you want to animate the Sea Monster Dwelling by adding glowing effect on eyes and tail of a object should be movable. First step is to choose appropriate software, Photoshop for example. Glowing effect should be done on separate layer. If you want to do same in space of fish mouth you need to know how to create clipping mask. By various selection technique you can isolate tail, place them on separate layer, assign pivot point and start to move it. I'm familiar with layers but my current attempt with the tail just isn't good. It's not smooth if you will, coz changing the angle of the tail makes it more pixilated, but thanks anyway for the reply.